I’m honored to be a featured writer on the AAAS website as a winner of the AAAS/Subaru SB&F Prize for Excellence in Science Books! Receiving this prize was an amazing moment in my career, and I am so proud to share that This Book Stinks! is now prominently featured in Subaru dealerships around the country as part of their Subaru Loves Learning program. Not only that, Subaru has donated copies of all of the prizewinning books to thousands of classrooms around the country. Knowing that the message of This Book Stinks! is being spread among so many readers makes me so very happy. Thank you to the Horn Book, THE SOURCE for literature for children and young adults, for giving THIS BOOK STINKS! some love recently. Here's the review, find the real deal here! THIS BOOK STINKS added to the longlist for the AAAS Excellence in Science Books! Science Books & Films is pleased to announce the titles that have been selected for the longlist for the 2018 AAAS/Subaru SB&F Prizes for Excellence in Science Books. SLJ Review of This Book Stinks! School Library Journal (SLJ) recently covered This Book Stinks, giving it a glowing review and calling it a "strong purchase for any middle grade nonfiction collection" which will "open the minds of young ecologists to this hot-button topic." Full review below. Thank you, SLJ for your coverage! FLYNN, Sarah Wassner. This Book Stinks! : Gross Garbage, Rotten Rubbish, and the Science of Trash. 128p. charts. diag. index. photos. National Geographic. Mar. 2017. Tr $24.90.ISBN 9781426327315; pap. $14.99. ISBN 9781426327308. Growing up in the D.C. area with an AM-radio loving dad, WTOP has been a part of my life for years. So it was a true honor and thrill to be featured on the station a couple of weeks ago on the heels of the release of This Book Stinks. A bunch of friends and family in the area also happened to hear the clip live on the radio as it ran throughout the day on the station. I feel like I've really made it now...hah! Here's the story WTOP featured online and the (very brief) interview clips. 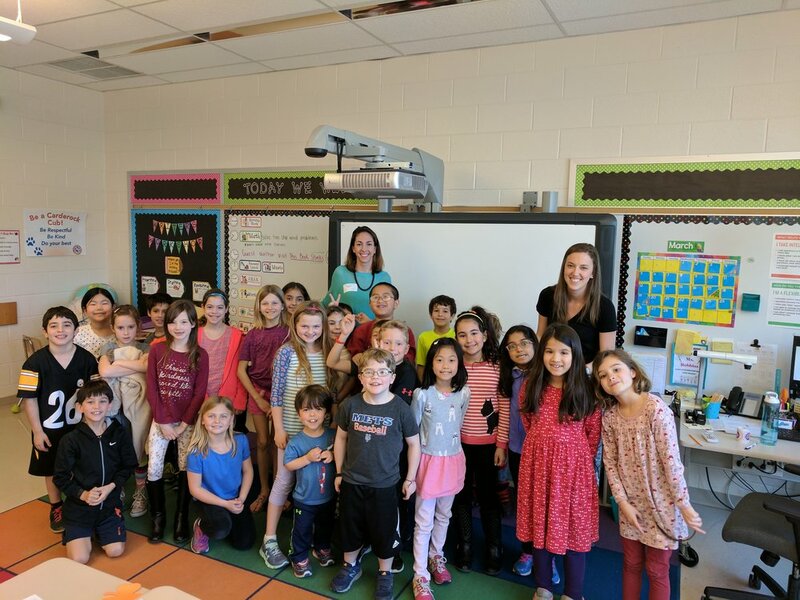 I had the pleasure of visiting a few elementary schools over the past month to chat about life as an author and share my books with some very inquisitive and smart students. Nothing validates my work more than interacting with my readers--they ask great questions! Here are some shot of me heading back to school. 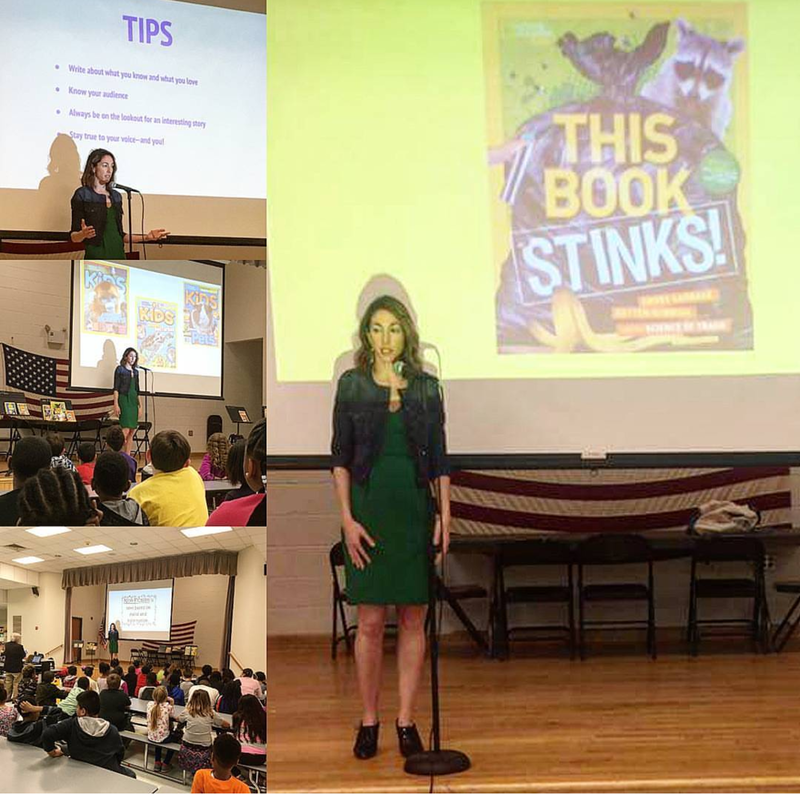 Thank you to Bear Elementary, Carderock Springs Elementary, and Beverly Farms Elementary for having me! Kirkus Review Gives Praise to This Book Stinks! No trash talking here! Honored to receive a glowing write-up from Kirkus Review! Stinky facts about waste and what we can do about it. With lively, colorful design and limited text, Flynn takes on the problems of the “staggering amount of trash” we humans create and offers suggestions for appropriate waste disposal, recycling, reuse, and composting roughly organized into chapters. Each double-page spread covers a different topic, introduced with an attention-getting headline (“From Filth to Fashion”; “Food Waste Facts to Chew on”) and developed with factoids and short paragraphs. These are presented on colorful, geometric backgrounds and strewn around the pages along with drawings and photographs and splotches of color. The effect is almost overwhelming, which may be the intent. Flynn explains how landfills work, describes the plastic in our oceans and debris orbiting the Earth in space, and points out how our food waste could feed the hungry. She introduces garbage collectors, dumpster divers, artists who reuse materials, and a trash activist. She shows that problems of waste management are worldwide, and she offers examples of progress from many countries. The juxtaposition of problems and possibilities makes this a more positive book than it might have been, and there are suggested activities that are well within the capacity of the middle-grade audience. If you'd like for your school or group to be added to the list, please contact me!